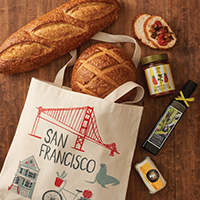 Our bread paired with the best tastes of Northern California. 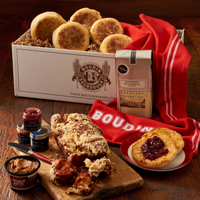 Tempt your tastes buds with our breads and savory accompaniments. Includes a 1.5 lb sourdough round, two sourdough baguettes, one Asiago cheese bread, a 11 oz. 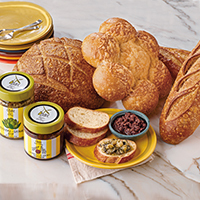 jar of Olivier Artichoke-Spinach Dip & a 8oz jar of Olivier Black Olive Tapenade. 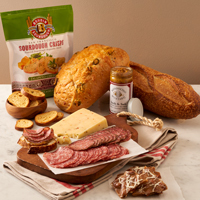 No need to choose just one –Our classic sourdough round and long loaves are paired with artisan spicy jalapeno cheese sourdough and sweet cinnamon raisin loaves. 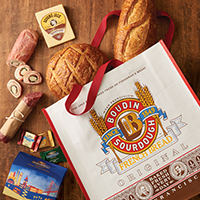 These favorites come packaged in a Boudin reusable shopping tote. 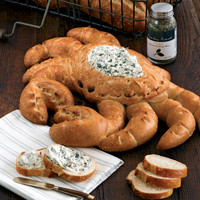 Get a baked crab sent to your home from our bakery at Fisherman’s Wharf. Our fun-to-eat creation is perfect for artichoke dip. 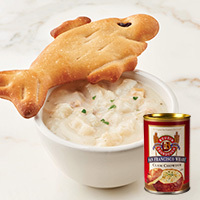 Includes a hand-sculpted sourdough crab, .52oz pouch of Gourmet Village Hot Parmesan & Artichoke Mix, two sourdough baguettes. 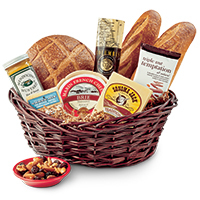 Simple, elegant, delicious – that’s how we’d describe our Classic Dipping Oil gift. 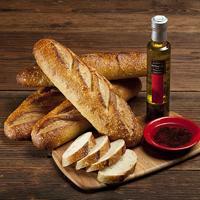 We’ve paired Tulocay’s of Napa Valley 8.45oz Balsamic Dipping Oil with 4 of our fresh sourdough baguettes and a classic red ceramic dipping dish for an appetizing treat. 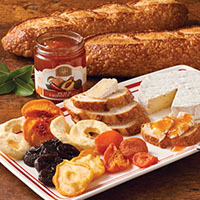 The perfect appetizer for your Fall and Holiday celebrations. 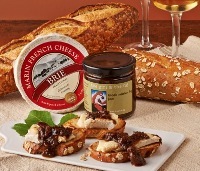 Gift includes: 2 Sourdough baguettes, an 8oz wheel Marin French Brie and an 8oz Black Mission Fig Jam. 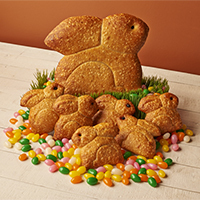 Send your college students a taste of home which includes six of our whimsical Sourdough fish loaves and a can of our world famous Boudin Clam Chowder.